When I bought the bottom set of drawers from Ikea I originally thought I'd be putting all my sewing/textiles things in them. I'd just finished a year of Art Foundation specialising in fashion textiles and I was then going on to study printed textiles at university so I had a lot of related products. 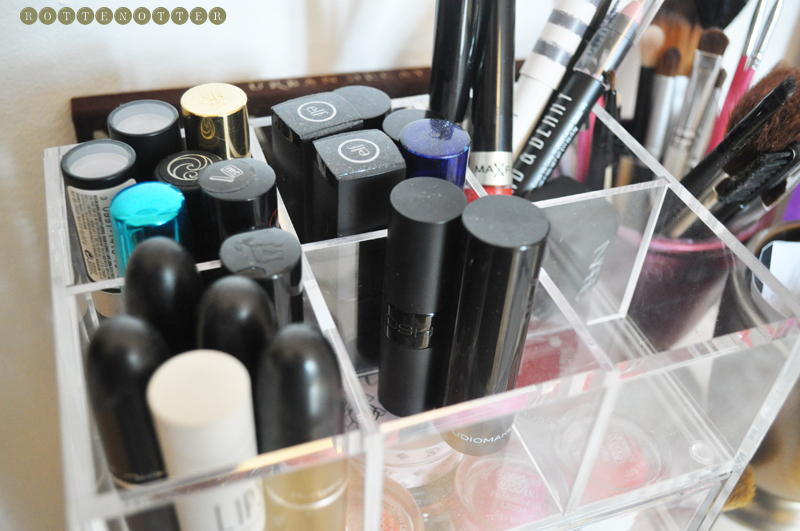 Textiles was a huge part of my life back then, over two years ago, but then my make-up collection out grew my old storage thanks to starting my blog and reading other beauty blogs. 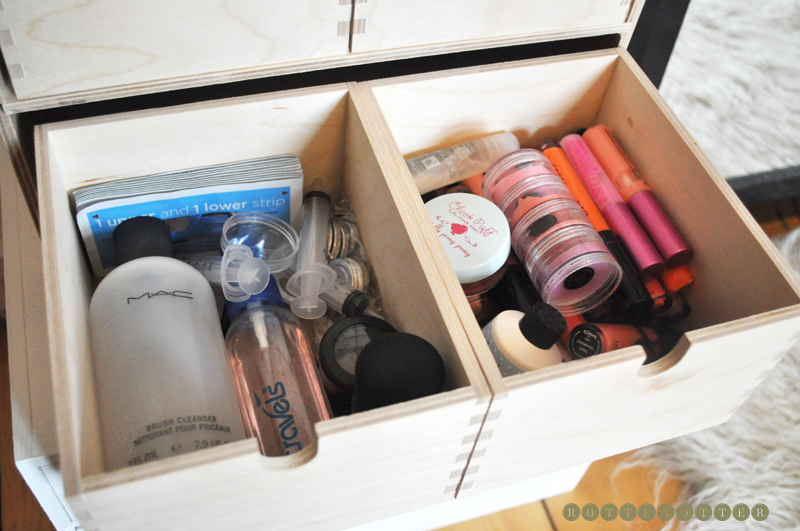 After reading Anna's post about cutting down her make-up collection to only one drawer it got me thinking, could I do a similar thing? She went with, if a product hasn't been used for 6 months then it's got to go. Although I think this is a great, I just couldn't do it! I have the bad problem of always thinking, oh but there may be a time where I'll use it so I'll just keep it. This goes for clothes too. 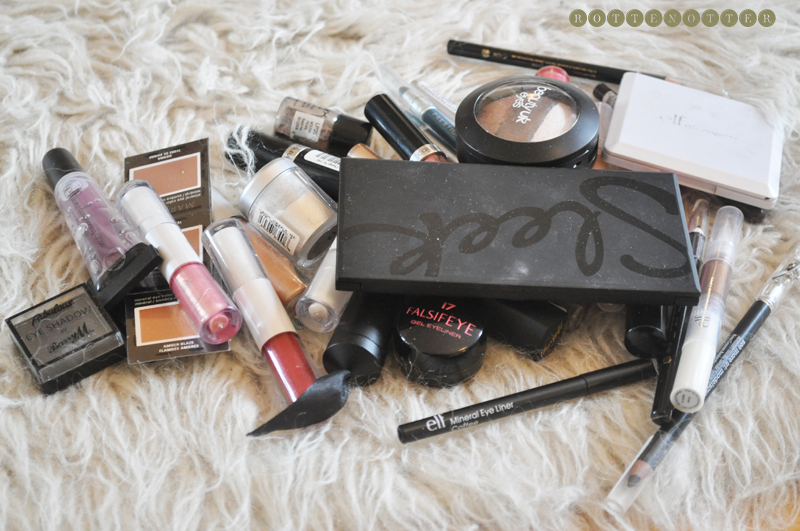 Here's the things I'm either throwing away or adding to my pile of products going to Give And Make-up. 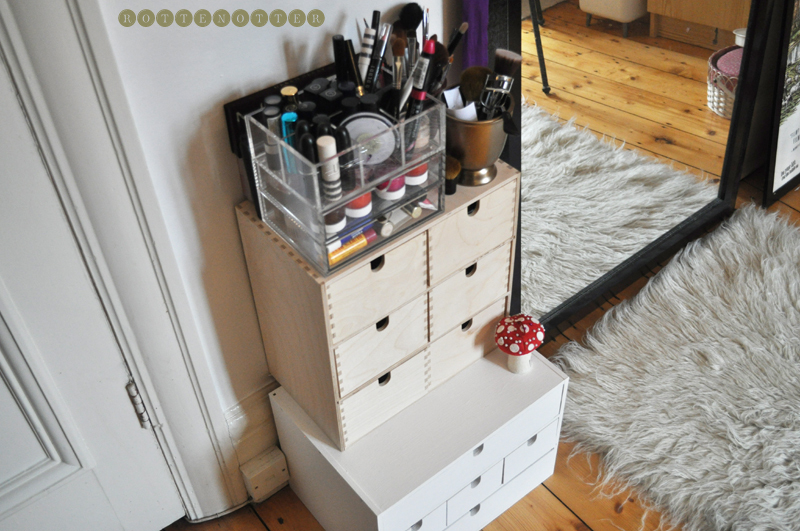 My make-up now fits into the top set of drawers and the few bits on top which I'm really pleased about. I'm now working on using up the products I wanted to keep but don't use too often like lip gloss and certain eyeshadows before I buy anything new. 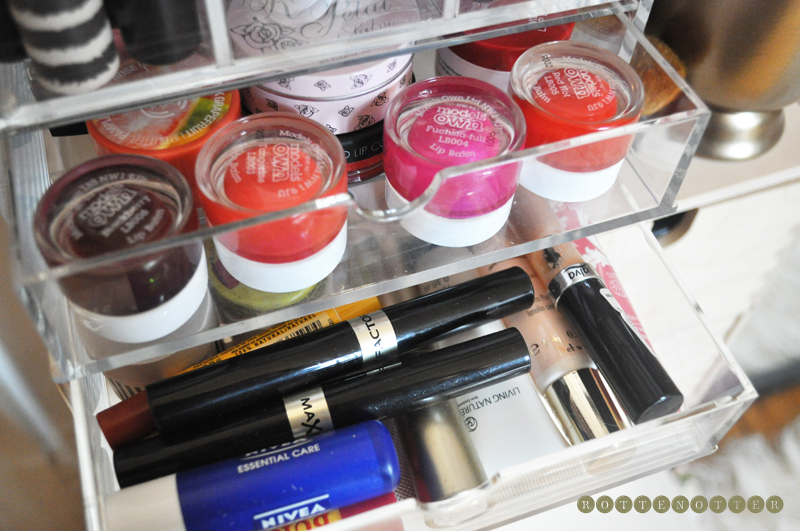 On top of the Ikea set of drawers I have some clear acrylic storage from Muji which holds my lipsticks and lipbalms. Behind this is my Naked palette and two Mac palettes. Then to the side is where I keep my brushes. 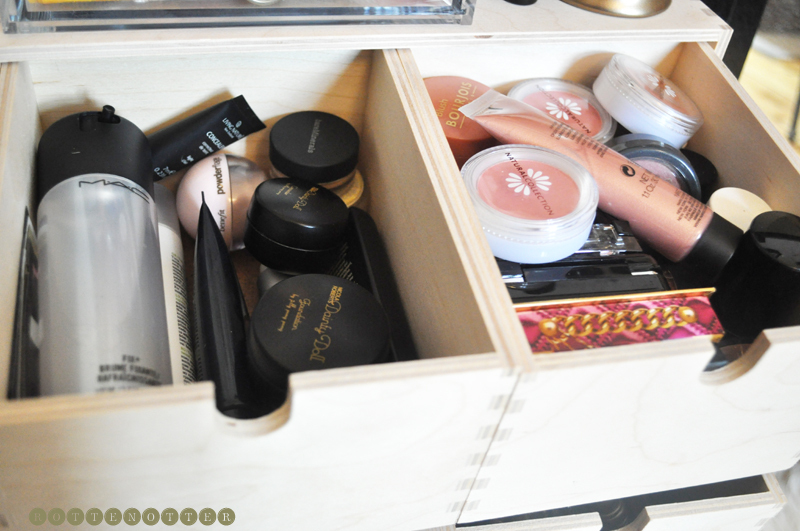 The first two drawers in the Ikea set hold my face products such as tinted moisturiser, powder and concealer. The next one has all my blusher, bronzer and highlighters. This one's a bit messy and full but can just about fit everything in. The next two drawers house all my eye products. The first is all my eyeshadows including my sleek palette, Mua trio's, Mac eyeshadows etc. The next drawer is a bit of a mess but it's quite easy to rummage through everything. 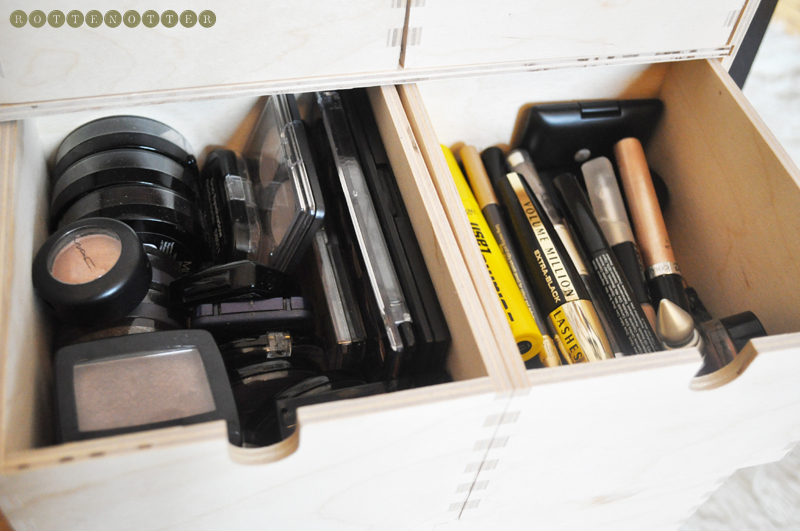 In here are my mascaras, eye liners, brow products and eye primers. Then the last two drawers hold my lipglosses then random things like empy back to Mac stuff, things for depotting and pressing eyeshadows and brush cleaner.